New Blog Kickoff and Giveaway! I am thrilled and excited to be a part of a new collaboration group for upper elementary! 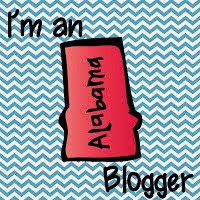 I have been invited to join eleven fabulous bloggers and TpT'ers to bring you "snapshots" into our classrooms! Take a look at Upper Elementary Snapshots, and you may find some fabulous ideas and resources for your own classroom! 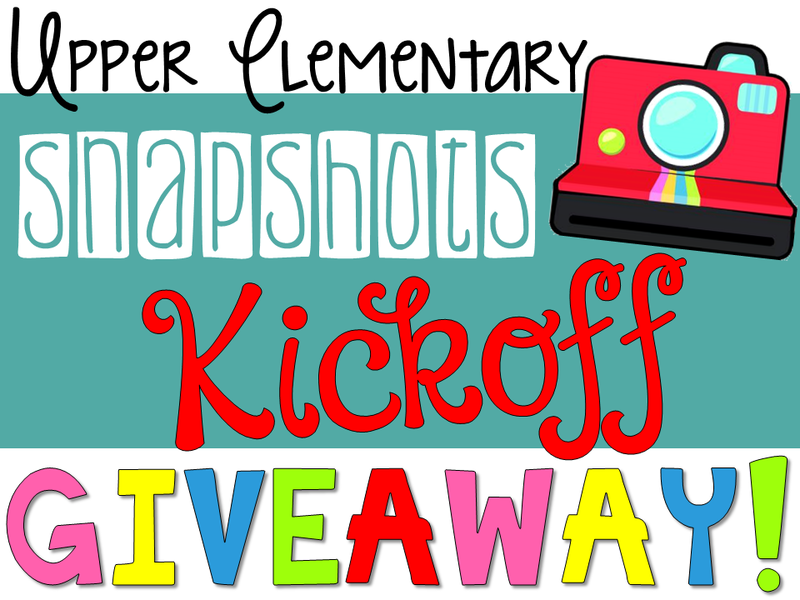 Upper Elementary Snapshots is the name of our new blog. 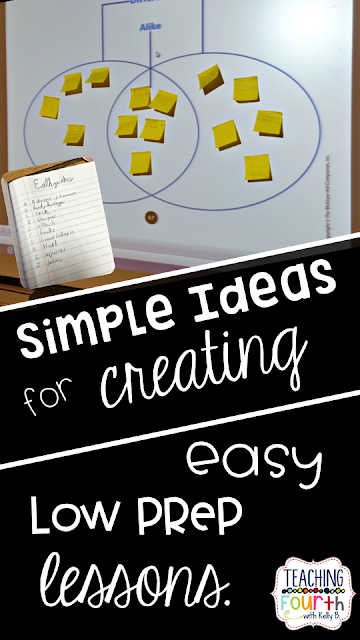 Fabulous ideas will be posted every week! Visit the "Meet the Collaborators" page to get to know a little bit about us. 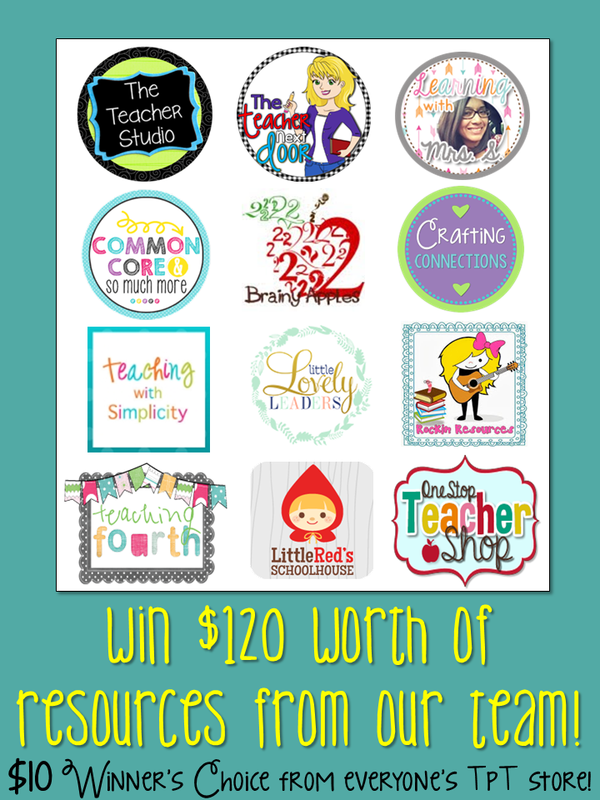 Check out the "Freebies" page for fabulous items for your classroom! Be sure to follow so you won't miss any of the wonderful ideas and freebies that we will be sharing! don't miss out on the fabulous giveaway! items from 12 top TpT sellers! My school year is now rolling full speed ahead! I always look forward to the feeling that I have when it seems that the students and I are in a routine: beginning of the year routines are established, the kiddos know and understand my expectations, and daily routines are in place. Well, I think we have made it there! Yay! Now; however, we are busy, busy, busy! Not only am I busy with school stuff, but my life at home is busy, too! My youngest daughter has volleyball games or practice every afternoon. Both of my girls are showing cattle again, and those shows are scattered throughout our schedules. Sundays for us is church day. Life is busy, but good. With so much going on, it is hard to find time to create beautiful, showy lessons. You know the ones I'm talking about. Those "Pinterest" worthy lessons that are so cute and colorful and take hours of cutting, planning, and preparing. 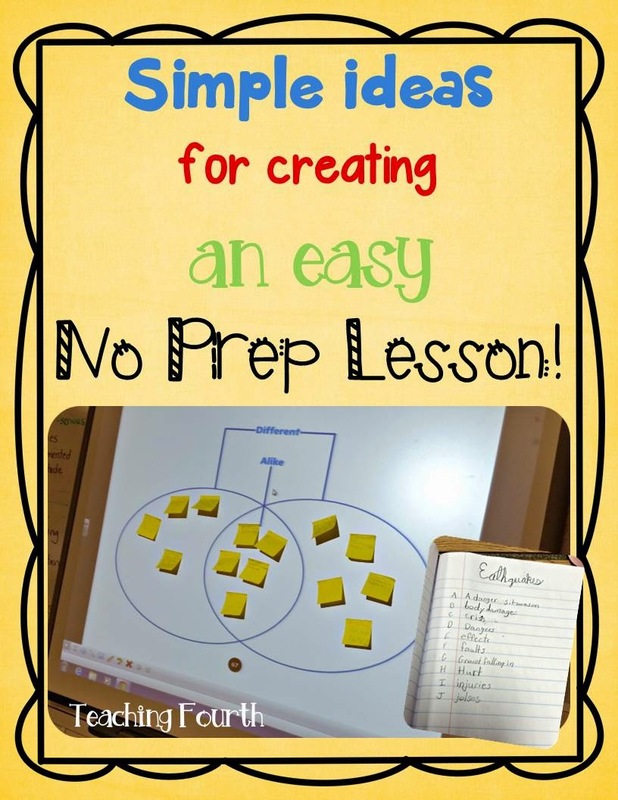 Well, I want to share how I created a very good lesson that took very little prep. Yes, it is not showy and pretty, but I think it met the needs of my students. Several years ago, we went through strategic reading training that focused on "before, during, and after" reading strategies. Unfortunately, last year, we adopted a new reading series, and once again, all of the teaching strategies that we had worked hard to established were thrown out the window. (You know what I mean. It seems as educators, we are told and trained to use one technique, but when we finally establish using it, we are told to abandon it, and use something completely different.) This year, however, I am trying to work to incorporate those reading strategies back into my lessons. 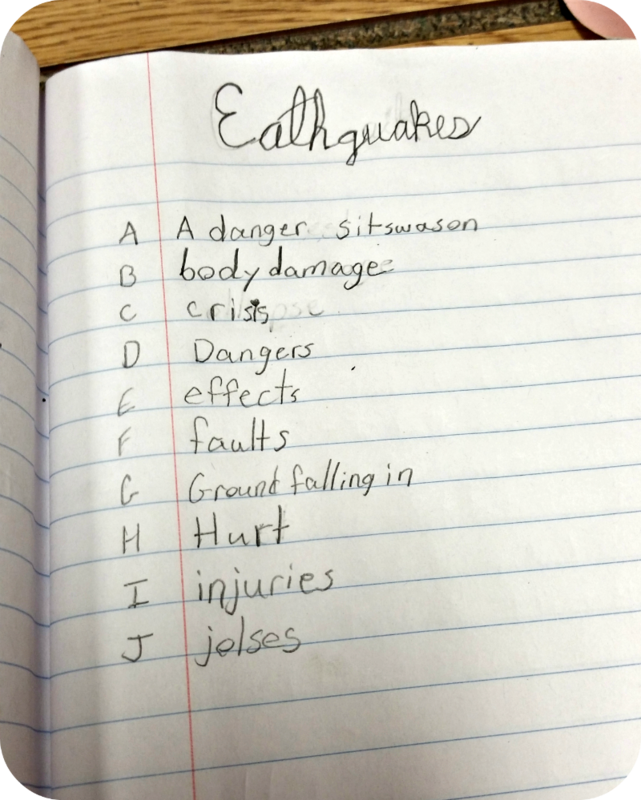 This week we read a nonfiction text (from our reader) about earthquakes. So, for my "before" reading strategy, I used an A,B, C brainstorm. You are probably familiar with this. Usually, the teacher gives the students a handout with the alphabet listed in columns. The students simply brainstorm and use their prior knowledge to write words or phrases (beginning with each letter) that are related to the reading topic. For example: A: a type of natural disaster B: below earth's surface C: crisis can be created D: destroys, etc. Unfortunately, to complete an entire alphabet can take twenty to thirty minutes, so I simply had my students to write only the letters A through J (you could do any amount or set of letters you want such as L through P). They wrote this in their reading journals, and I gave them five minutes to brainstorm. When time was up, my students turned and talked to their reading partners to share their thoughts. This is mainly to build an interest and help them recall background knowledge about the subject. Did you notice that this took absolutely no prep for me? Nothing to cut out, run off, or laminate! As we read the text, I simply used the reading strategy, "think, pair, share." I love this strategy and use it almost everyday. (This was the one strategy that I did not abandon last year.) I often simply call it "turn and talk." As we read the text, I occasionally stopped and asked an important question. Students would look back at the text and "think." Then they would "share" with their partner (that they were already paired with). I established partners at the beginning of the year, so my students know who they are working with. This strategy gets everyone thinking about their reading and discussing. Once again, very little prep. I just chose questions that were in my teacher's manual. Very easy! After reading, I used stick notes for "jot notes." Our focus during this lesson was comparing and contrasting. For example, we used the text to compare and contrast tsunamis and hurricanes. Now, I could have taken the time to create a nice and colorful anchor chart, but remember, my theme today is no prep. I chose, instead, to use a pdf version of a Venn diagram to project onto my Smartboard. The one I used was part of my reading series, but here is a free one that I found online. I simply projected the Venn diagram. I gave one set of students "tsunamis", another set "hurricanes", and the final set of students "both". Each student looked back and read closely in the text to find the information and write it on the sticky note. 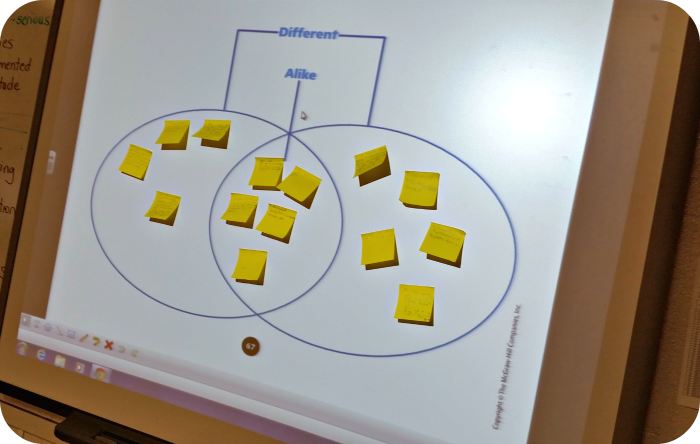 We then went around the classroom and shared, and students put the sticky note in the correct circle on the board. This was also a great way for me to assess who needed more instruction with comparing and contrasting. Once again, no prep! Super easy, but very effective! I must say that I think this lesson was a huge success! Every lesson does not have to be hard for the teacher. Sometimes the simplest lessons turn out to be some of the best. We have also been learning about compound sentences this week. 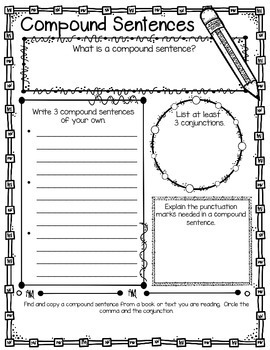 I love graphic organizers, so I decided to create a graphic organizer for compound sentences. I chose to use this as a formal assessment following lessons on compound sentences. Not only did this serve as an assessment for me to evaluate my students' understanding, but these graphic organizers turned out very cute once my students colored them, and they will look great displayed on the bulletin board. Now for the best part, I am giving this to you for free! I hope you enjoy this little freebie! 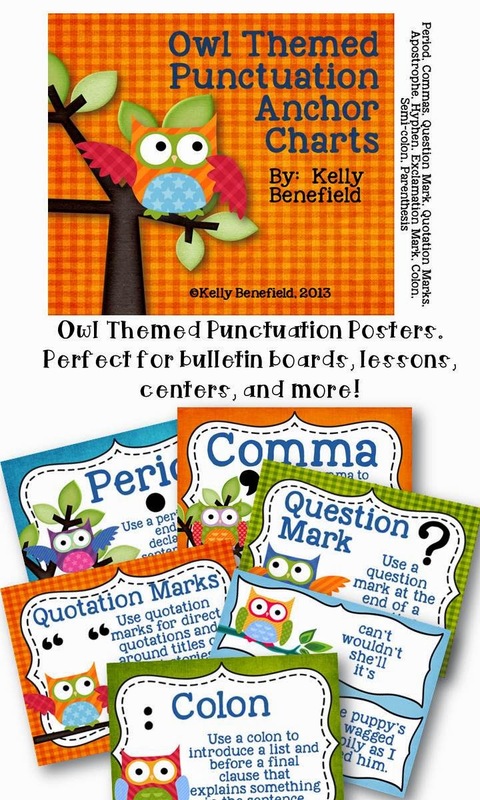 Click on the picture below to download from my TpT store. I love a cute bulletin board! It can add so much color, creativity, and interest to a hallway or a classroom! This year at my school, one of my teacher friends has really outdone herself on her bulleting boards! 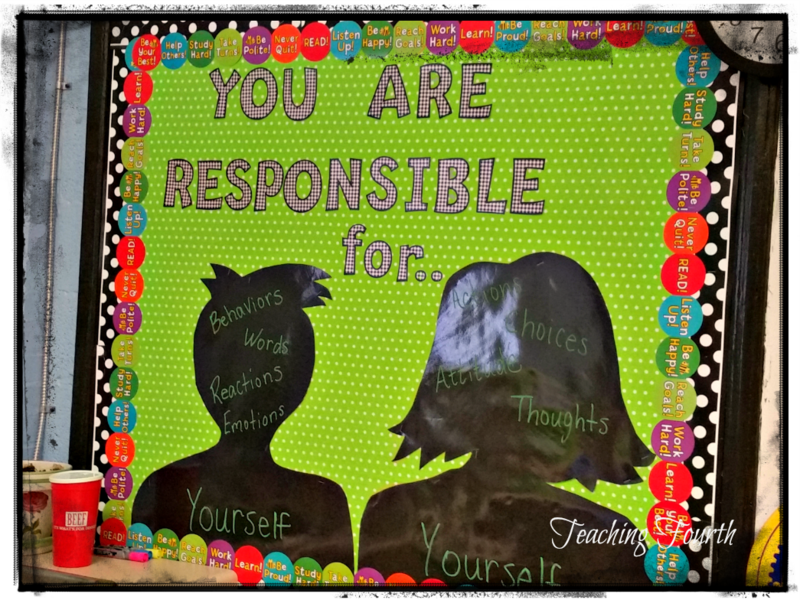 The has created some super cute bulletin boards inspired by Pinterest (of course), and she is letting me share them with you! I just love her bright colors and creative designs! Paint you own future! 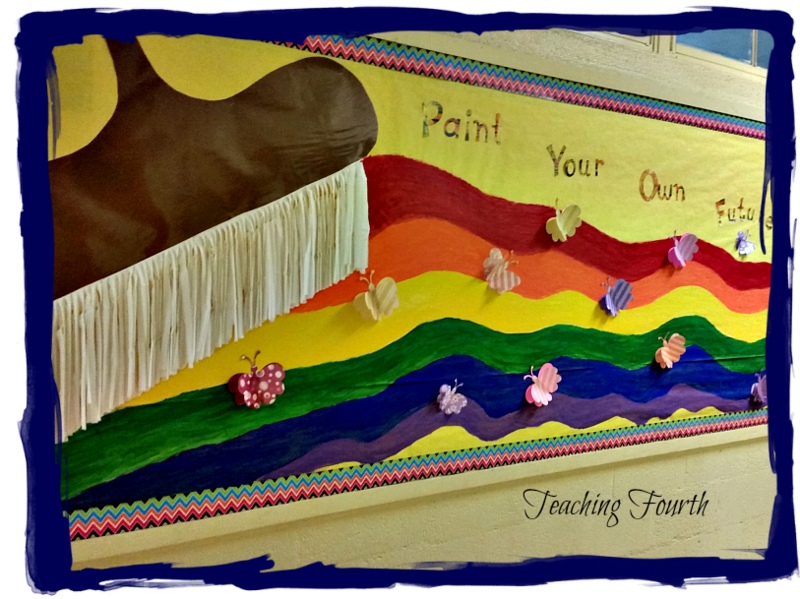 I love the little 3D butterflies on this colorful bulletin board! This board really brightens up our main hallway! You are responsible for yourself. I love the black silhouettes on this bulletin board. They really pop against the bright green background. I also like the message of this bulletin board. 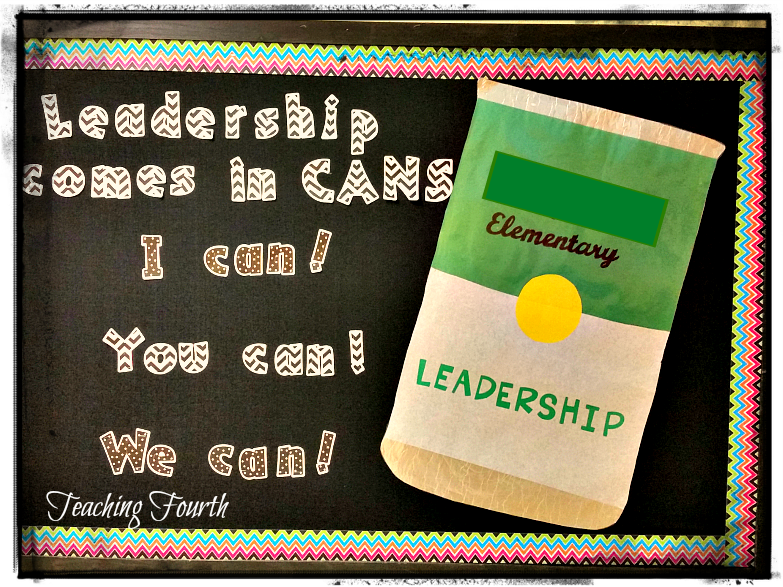 Leadership comes in cans! Isn't this bulletin board just darling? As you can see, I work with some very talented teachers!